Perhaps the National Ape Foundation and Alan Alda should have done some research on Gini Valbuena, her history of Chimpanzee Babes before they decided to hire her. Exploiting Chimpanzees is no way of getting good attention for something that you are trying to do good for the Chimpanzees. Shame on all of you! 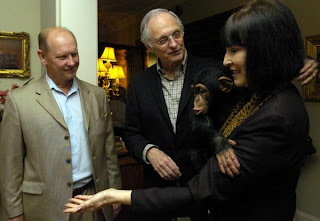 Published: Mar 28, 2008 - Page: 1BA - UPDATED: 12:05 a.m.
Lafayette Parish President Joey Durel, left, and actor Alan Alda talk with Gini Valbuena, who holds her chimpanzee, Noah, on Thursday in Lafayette. LAFAYETTE — A recently formed group looking to create a national attraction in Lafayette centered on chimpanzees made the formal announcement of their effort Thursday night. Members of the National Great Ape Foundation, based in Lafayette, are trying to draw interest in their proposed National Chimpanzee Observatory and Great Ape Zoological Gardens, which they say would be the first and only such facility of its kind. The board members all live in the Lafayette area, though the group has a national connection through University of Louisiana at Lafayette’s Daniel Povinelli — director of the university’s Cognitive Evolution Center and national program director for the National Chimpanzee Observatories Working Group. On Thursday, invited guests at the group’s public debut included popular television and film actor Alan Alda and a 2-year-old chimpanzee named Noah. Noah was on hand as a living demonstration of what the proposed attraction would be helping to preserve and what it would offer to visitors. Alda, meanwhile, was on hand with filmmaker Graham Chedd because the two are partners on a PBS series on what makes humans human. Board member Denise Dufour said that the attraction, estimated to potentially be a 250-acre facility, would be an environmentally friendly tourist attraction with islands for the chimps, education facilities for visitors, botanical gardens, bird sanctuaries, a hotel and a convention center. Povinelli said that such a self-sustaining center for chimpanzees exists nowhere else in the world. He said that chimpanzees and other great apes are on the verge of extinction, likely to have too few members of the species left in the next five to 10 years to continue to be genetically viable. Povinelli said that only about 100,000 chimpanzees are left on Earth, down from about 1 million in 1960. He said that the federal government pays for places to keep chimpanzees that have been used in research, but those facilities are a drain on the federal budgets. Povinelli said that the proposed attraction could not only provide a new home for such chimpanzees, but could take chimps from somewhere that they are costing money to sustain, to living in a place that earns money. Gerald Breaux, director of tourism in Lafayette, said estimates are that the attraction could bring in $80 million to $120 million a year once fully operational. Gregg Gothreaux, president and CEO of the Lafayette Economic Development Authority, said that the facility could also mean 500 new permanent jobs for the area. He said that state Sen. Mike Michot, R-Lafayette, is already working to request $10 million from the state to support the project in planning and site selection. Gothreaux said that once private investors see that kind of money put toward the project, they will be more likely to take an interest. Povinelli said that the attraction will not need government funding to help with operational costs, only the initial build out.